but they grounded their pupils well in mathemathics and the other two "R's." The early comers suffered hardships hardly credible to-day and such as would appal [sic] the present generation. Recollections of these early incidents remain fresh in Mr. Dennis' mind, and he relates them readily and well. Mr. Dennis joined the Modern Woodmen of America at Coleridge, and was made a Mason in the Osmond lodge of that order. John Welsh, a prosperous and much respected farmer of St.Paul precinct, whose well developed farm adds greatly to the prosperity of the locality, is a man of untiring energy, and classed among the substantial agriculturists of Howard county. He has made this region his home for the better part of thirty-six years, coming to the county in 1873, although some of this time was spent in travel through the other western states. Mr. Welsh is a native of Huron county, Canada, born January 23, 1860, and was the fifth child in a family of nine. When he was a lad of eleven, his parents settled in Sanilac county, Michigan, remaining there for about three years, at which time himself, mother, two brothers and two sisters joined the father in Howard county, Nebraska, he having made settlement here in April, 1873, and they following in October of the same year. They were located on a homestead and timber claim, situated in section thirty, township fifteen, range eleven, and farmed the place for three years, then purchased some land on section thirteen, township fourteen, range twenty-four. Mr. Welsh continued on this place until his death, which occurred May 1, 1880, and at that time was owner of four hundred and twenty-seven acres, all well-improved and valuable land. He had become one of the well-known and highly respected citizens of his locality through his integrity and sterling character, and his death was a severe loss to the community. His wife survived him for many years, she dying at the home of her daughter, Mrs. Carrie Fraim, on April 16, 1907, leaving six children to mourn her loss, all of whom live in Howard county except one daughter, who is in Michigan. Our subject has made Howard county his home place since first coming here in 1873, with the exception of short absences at different times. His farm is situated on section nineteen, township fifteen, range ten, and is fully improved and equipped with every kind of modern buildings and machinery. Mr. Welsh has held different local offices, serving as road overseer for a number of years, also has been director of his school district for several years. On September 14, 1881, Mr. Welsh was united in marriage to Miss Edith C. Haggart, the event occurring at St. Libory, Howard county. Mrs. Welsh is a native of New York state, coming into Howard county with her parents in 1873, the family being among the first settlers in the Sand Hills country. Nine children have been born to Mr. and Mrs. Welsh, named as follows: Ura Edith, who is the wife of Austin Jacobs, living in St. Paul; James D., married and living in the northern part of Howard county; William E., Daniel Everett, Charles Arch, Mabel Elizabeth, Leola Myrtle, Anna May and John Burton, the last mentioned seven children all living at home, and all together form a most interesting family group, their home being one of the pleasantest a weary traveler could wish to find, and where each comer is made to feel cordially welcome. Richard Flynn, son of Richard and Elizabeth Flynn, was born February 13, 1856, in Warren county, Ohio; he was youngest of three children, none of whom are now living. February 13, 1876, Mr. Flynn enlisted in the United States regular army for western service in Company D, Fourth Infantry, serving ten years during which time he was promoted to first sergeant. He was wounded in the battle with Sioux Indians at Rosebud creek June 9, 1876; he also engaged with the Sioux at Tongue river in the above named month and year; and he was in another engagement at Slim Buttes, September 9, 1876; Mr. Flynn received his discharge February 13, 1886. On September 22, 1878, Mr. Flynn was united in marriage to Marilla Frederick, daughter of Wolfgang and Emma (McCart) Frederick; Miss Frederick was born in Richland county, Wisconsin. The first four years of her married life were spent at Fort Laramie, and the next four at Fort Omaha. After his discharge from the army Mr. Flynn located in Valley county, Nebraska, where he lived until the time of his death, April 18, 1895, survived by his wife and ten children; Elizabeth M., wife of Ed Knapp, lives in Valley county, Nebraska, and has three children; Frank, who is married, has two children, and lives in Valley county; Richard P., also married and living in Valley county, has one child; Daisy, married May 7, 1911, to Roscoe Arnold, of Valley county, and Maisy, teacher in Valley county schools, twins; Bessie, died December 18, 1901, and Clifford, and Wesley and Leslie, twin boys; and Rachel L., all of the latter reside at home. In the spring of 1902 Mrs. Flynn purchased one hundred and sixty acres of land in section twelve, township nineteen, range fourteen, which is now the family home. Mrs. Flynn is recognized as the first white woman on the Upper Loup, having come with her father to this section in 1872, and the family are widely and favorably known. Mrs. Flynn's father, Wolfgang Frederick, was born in Germany, October 26, 1826. In 1843 he came to America, locating in Wisconsin, where he had one sister living. He was married to Miss Emma McCart, of Wisconsin. Early in 1861 he enlisted in Company F, Wisconsin cavalry, serving all through the war. After the war he returned to Wisconsin, living there until 1872 when Mr. Frederick, with his daughter Marilla, came to Valley county, Nebraska, homesteading one hundred and sixty acres of land in section twelve, township nineteen, range fourteen, where he lived a number of years; then going to the National Soldiers' Home in Leavenworth, Kansas, where he lived until the time of his death, October 31, 1906, survived by his daughter, Mrs. Marilla Flynn. Mrs. Frederick died in Minnesota, October 8, 1908. Mr. Flynn was reared a Catholic. In politics he was a populist, and was a member of the Modern Woodmen of America. John H. DeGroot, retired farmer, son of High and Henrietta (Bierman) DeGroot, was born in Germany, October 14, 1849, and was the eldest of nine children, two of whom are deceased. He has one brother in the state of Kansas, and five sisters in the state of Illinois. His father died in 1895, and his mother in 1906. In 1869, Mr. DeGroot came to America, locating in Illinois, and followed the occupation of farming and carpentering. He was married February 26, 1875, to Miss Anna H. Eckman, also a native of Germany, whose father died in 1905, in the state of Illinois, and mother died in 1880, also in Illinois, and who has two sisters living and one sister and one brother deceased. Mr. and Mrs. DeGroot have had thirteen children, whose names are as follows: Henry J., who resides in the state of South Dakota; Albert J., married and lives in Madison county, Nebraska; Henrietta J., married to Miron Wakely, they have two children, and live in Madison county; Theodore J., married and living in Buffalo county, Nebraska; Tadia J., who lives at home; Antone J., married and lives in Madison county; Anna J., who lives at home; Jennie J., married to James Grant, and lives in Emerick, Nebraska; Lena J., deceased in 1906; John J., lives at home; Hannah J., also at home; Fred Dewey, at home; Willie M., deceased, in 1901. In the spring of 1883, our subject came to Nebraska, locating in Platte county, where he purchased forty acres of land eight miles northeast of Platte Center, later on, buying another forty acres adjoining. After seven years residence in Platte county, Mr. DeGroot sold his interests and moved to Madison county, and purchased a half section of land in the north half of section seventeen, township twenty-two, range one, west, which was the home place until July 28, 1904, when Mr. DeGroot retired from the farm and moved to Madison, where he purchased a good home. There he remained until August 5, 1910, when he moved to Corning, Tehama county, California. Mr. DeGroot has been energetic, therefore prosperous and successful, and owns eight hundred acres of land, mostly in Madison county, nearly all of which is under cultivation, with good buildings and equipments. Our subject served nine years on the school board of district number forty-seven. Mr. and Mrs. DeGroot are among the early settlers of Nebraska, and are widely and favorably known. Mr. DeGroot is a man alive to all interests of his state and county, and is a prosperous man of affairs. George B. Crist belongs to a family that has long been prominent in Custer county, Nebraska, and several members of it are given mention elsewhere in this work. George B. Crist was born in Putnam county, Ohio, September 22, 1851, the oldest of eight children born to John W. and Sarah (Hull) Crist. He has a brother, Levi Crist, now living near Kirk, Colorado, the others of the family are deceased. His father, who was of German descent, was born in Ohio and served in Company B, Second Nebraska Cavalry during the Civil war, having come to the state as early as 1856, settling at Desoto in Washington county. He died in Arkansas in 1899. The mother, also a native of Ohio, and of Irish descent, died in Washington county, Nebraska, in 1866. As an infant, George B. Crist accompanied his parents to Iowa, where the family lived until 1856, then came on to Nebraska, locating in Washington county. When the father enlisted in 1864 the family was living in Iowa for a time. After the war they all returned to Nebraska, where George B. grew to manhood and received his education. He then engaged in farming and in 1883 moved to Custer county and homesteaded on one hundred and sixty acres of land on section twenty-seven, township sixteen, range seventeen, which is still his home. On January 7, 1886, Mr. Crist married Ella Gentry, who was born in Dekalb county, Missouri, a daughter of A. J. and Mary J. (Cowan) Gentry, who in 1863 came to Sarpy county, Nebraska. Mr. Crist and wife have four sons, all at home, namely: John A., Charles C., Francis M., and George R. G. Mrs. Crist's father, was born in Indiana, and died in Custer county, in 1895. The mother, was born in Knox county, Tennessee, and died in Custer county in 1906. Mrs. Crist has four brothers and one sister in Nebraska, one sister in California, and one sister in Oregon. cess came as the result of untiring energy and industry, coupled with a brave disregard of discouragements. In politics he is a democrat. He and his wife are able to enjoy their present prosperity with a keen sense of its worth and the feeling that it is well earned. Among the representative farmers of Wayne county, Nebraska, who have become substantial citizens by persistent efforts and integrity, a prominent place is accorded to the gentleman named above. He has been a resident of the state for many years and has a valuable farm located on section four, township twenty-five, range five. Mr. Hammer is a German by birth, having been born in 1850 in the Province of Holstein. His parents were John and Dora Hammer. The subscriber received his education in Germany, and remained at home, helping his parents on the little farm, until 1870. Just at this time, he determined to join the tide of emigration which was pouring towards the United States to find, if possible, the land of opportunity. He came by way of Hamburg and New York, going directly to the state of Iowa. He started farming in that state and remained there for about twenty years. In 1890, he came to Wayne county, Nebraska, and bought a farm of eighty acres, in section five, where he lived until he bought his present home about 1901. He now owns two hundred and forty acres of land. Mr. Hammer was united in marriage to Miss Minnie Wolf in October, 1885. They are the parents of nine children, named as follows: Mary, Fernand, Lillie, Ed, Harry, Tena, Rudolph and Ray, (twins); and Lena. Claus Frederick Holtorf, one of the old settlers in Merrick county, Nebraska, is well-known throughout the community in which he resides as a prosperous and successful man and a citizen of true worth. He has always taken a deep interest in the development of the locality in which he has chosen to reside, and is widely known and universally respected and esteemed. Claus Frederick Holtorf, is a son of Carson and Weapke (Nottlemann) Holtorf, and was born in Holstein, Germany, December 5, 1841. He was eldest of ten children, and has one brother and a sister in Germany; one brother in Central City, the others being deceased. The mother died in 1899, and the father in 1861. Mr. Holtorf received his education in his native country, and there learned the brickmaker's trade, and came to America, June 9, 1865, locating in Indiana, where he followed the occupation of molding brick for about two and one half years, then going to Illinois for a short time, also spending some time in Iowa. In the spring of 1867, he went to Omaha, Nebraska, where he still followed his occupation of brick-making. On July 6, 1867, Mr. Holtorf was married to Miss Catherine Riemers, also a native of Germany, who came to America in 1864. Mr. and Mrs. Holtorf have had eight children born to them seven of whom are living: Adolph Frederick, who resides in Merrick county, Nebraska; Rosa G., wife of T. Neuhofel, has seven children and resides in Merrick county; Minnie F., wife of George Grage, has six children, and lives in Merrick county; John H., married, has one child, and resides in Central City; Marx C., married, has three children, and lives on the old homestead; Wilhelm C., who resides in Merrick county; Molly, widow of George Stuart, has one child and lives in Merrick county. Mr. and Mrs. Holtorf made their first home in Davenport, Iowa, for nearly three years, then went to Tama City, Tama county, Iowa, where Mr. Holtorf established a brick yard. In the spring 1878, our subject came with his family overland to Merrick county, Nebraska, bringing with them thirty-seven head of cattle and five horses, and homesteaded one hundred and sixty acres in section ten, township fourteen, range six, which remained the home place until 1905. through the years they were prosperous and successful, and added to their land holdings until they now own five hundred and sixty acres, all within five miles of Central City, a well improved stock farm and one hundred and sixty acres under cultivation. In 1905 Mr. Holtorf retired from the farm and moved to Central City, and purchased a good home where they now live. He was director of his school district number twenty-one for twelve years. Mr. and Mrs. Holtorf were among the early settiers of the county. They are widely and favorably known. In 1889 Mr. Holtorf visited his home country; in 1893 he made the trip again, and in 1900 Mr. and Mrs. Holtorf spent six months in Germany. Mr. Holtorf is a progressive man of affairs, interested in all pertaining to the welfare of state and county. Few living in Nebraska today can give reminiscences of as early a date as Frank Weigand, retired, of Bloomfield, who has been a resident of the commonwealth since 1858, a time when there was but a narrow fringe of civilization along the eastern border of the state. Frank Weigand, son of Leonard and Theresa (Meyer) Weigand, was born in Berlin, now the capital of the German Empire, October 18, 1853, and his first birthday occurred while the family was at sea on their voyage to America. He was the eldest of nine children born to his parents. Being the mainstay, he remained with his father until twenty-five years of age before starting out for himself. At this time he married and filed on a homestead in the canyon known as the Devil's Nest, where he still owns two hundred acres, sixty acres of which are adapted to cultivation and the rest covered with a fine grove of hardwood timber. At the same time, he filed on a timber claim twelve miles north of Bloomfield, to which he moved in the spring of 1881. After proving up on his homestead, Mr. Weigand moved to a tract of his father's land near the river. When the great flood of March 30, 1881, came rolling down the valley, a wall of water thirty feet high. Mr. and Mrs. Weigand, who had been warned barely in time, escaped to the hills and looking back saw their log dwelling cave in, and their corn crib, from which they had just emerged, swept down the raging torrent. Oak trees two feet in diameter were broken off like twigs, and the noise of crushing ice and falling trees was terrible. In stock and grain Mr. Weigand lost over five hundred dollars, a considerable loss for him at that time. It was after this flood that he settled on his timber claim on the high ground, moving the dwelling from his homestead, and from that day began to prosper. He now owns eight hundred and eighty acres in the northern part of Knox county, where he raised horses, cattle, and hogs. On retiring from active farm work, in the spring of 1909, Mr. Weigand purchased a comfortable cottage home in the heart of town, only a block from the banks, stores, and postoffice. Mr. Weigand was married December 25, 1878, to Miss Lena Olsen, a native of the village of Lillahamer, Norway. As a girl, she came alone to the New World, followed later by her brother, and finally the parents, Mr. and Mrs. Ole Peterson. Sailing from Christina in the "Kingsvaal," after a voyage of three weeks she landed in New York, and came direct to Yankton, South Dakota, where she had friends. Work was offered her at the Santee Agency, and here she learned to speak the Sioux language fluently, even before she had mastered the English tongue. Six children were born to Mr. and Mrs. Weigand, namely: Rosa, wife of James Buchanan, a Virginian, and a relative of the former president, who is a professional ball player engaged on the Cripple Creek nine; and during the winter seasons a member of the Cripple Creek fire department; George Leonard, is married and lives at Chanute, Kansas, where for six years he has been private secretary to the division superintendent of the Santa Fe railroad; Frederick is engaged in farming on the old home place twelve miles north of Bloomfield; Laurence, after sojourning in Wyoming several years, is now employed in one of the Bloomfield banks; Rudolph is farming with his brother Fred in Knox county; Myrtle, the youngest, is a student in the Bloomfield grammar school. Mr. Weigand is independent in politics, voting for his choice of men in national as well as state and county elections. He is a member of the Lutheran church, and of the Modern Woodmen of America. Mr. Weigand has endured many hardships in the frontier. In 1873 or 1874 he lost his way in the open country during a blizzard and drove in it for fifteen miles before finding shelter in a distant neighbor's house; his finding the surveyor's stake and remembering the number, and recognizing a new board fence he had seen some weeks before, were his only guides to safety. On January 12, 1888, he was four miles from home getting timber on his homestead land. Though the storm was blinding, often freezing his eyes shut, he was able to follow the tracks his sleigh made in going to the timber, but he had to keep his eyes continously on the ground. Mrs. Weigand had gone to the barn to look after a sick horse when the storm broke, hiding the house in the frozen mist; she returned safely by following a fence to within a few feet of her door, but the house could not be seen at even a few feet distant. When Mr. Weigand got back, he ran into cattle that had sought the shelter of his house. These he drove into the lot and saved them, finding them to be his brother-in-law's. When the Weigands first came, buffalo, deer, and antelope, were plentiful, as were the fur bearing animals, beaver, otter, mink, foxes, muskrats, and others, but they have long since been hunted out. The family lived bountifully on meat, game birds being as plentiful as sparrows are now. In 1862 there was an alarm of an Indian uprising, and all the settlers sought refuge at St. James. Here they constructed earth works around the court house, Frank carrying water to the men at work. After a fortnight in arms the settlers returned to their homes, but for a long time great uneasiness was felt in the sparsely settled community. As a boy, Mr. Weigand played with the Wiseman children at St. James, the ones that were later massacred by the Indians, a bit of well-known local history in Cedar county. Yankton in those days was the nearest market and consisted of two or three houses and stores. The elder Weigand's home was a "halfway" house he keeping travelers journeying between Yankton and Bazile Mills or other settlements in that vicinity. The river was the great public highway in those days and steamboats were numerous. Old Captain Leech, from Sioux City, once visited the Weigand home, and recalled that he drove the stage between Fort Dodge and Sioux City, the day the Weigands came into the west. in the community than Mr. Weigand and his family, and few remain of the hardy pioneers who came into the Nebraska wilderness nearly sixty years ago and were instrumental in making it one of the garden spots of a galaxy of states. One of the prominent farmers of Stanton county, Nebraska, is the gentleman named above, who has for about twenty years been a resident of this section of the country. He is a gentleman of untiring energy and perseverance, and has done much to bring the community to its present high stage of development. He has a fine farm and comfortable home pleasantly located in section twenty-one. Mr. Carsen is native-born American, first seeing the light in Washington county, Virginia, in 1855. His parents were William and Margaret Carsen, the father, being a native of the state of North Carolina, while the grandfather came direct from Ireland. The greater part of the subscriber's life was spent in the east. He did not come to Nebraska until 1891, when he bought his present farm in Stanton county, where he has been located ever since. He has made extensive improvements upon the farm since purchasing it, and it is now a very valuable estate. Coming as late its he did, Mr. Carsen can hardly be classed as one of the old settlers of the county, yet he has done much in the way of assisting in its development. In 1876, the subscriber was united in marriage to Setha Wells, and twelve children have been born to them. In 1910, he was again married, to Mrs. Marshall. Mr. Carsen has been called to serve in a public capacity in the community in which he resides, having been elected school director and treasurer, which position he now holds. The present solid prosperity enjoyed in Antelope county, Nebraska, may be attributed largely to her pioneers. In the early days of her settlement when the only welcome tendered the stranger who settled there was a wilderness filled with wild beasts and Indians, little to encourage and much to discourage came to his lot, but those sturdy men who went to their new home with a determination to succeed and worked persistently and honestly, are now the prosperous and honored residents of their locality. The early settlers aided in bringing that wilderness to a high state of cultivation and civilization, and great credit is due them for their labor and influence. Mr. Burkhead is a native of Benton county, Iowa, born June 21, 1866. His father, George Burkhead, was born in the state of Ohio, in 1840, and died in 1896; his mother, before marriage, was Miss Sarah Kessling. Mr. Burkhead came to Antelope county on December 4, 1884, and bought one hundred and sixty acres of fine land, on section thirteen, township twenty-three, range six, which he has improved to a great extent, and it is now a fine farm. Mr. Burkhead was united in holy matrimony December 9, 1888, to Miss Elleanora Austin, born in 1872 in Green county, Wisconsin. Mr. and Mrs. Burkhead are the parents of three fine children, whose names are as follows: Ora, Alva, and Elsie, who is married to C. C. Jackson. Mrs. Burkhead was a native of Green county, Wisconsin, born in 1872. Mr. and Mrs. Burkhead and family are highly esteemed and respected by all in their community, and enjoy the warm regard of a large circle of friends and acquaintances. Joseph E. Bradburn and wife belong to two of the oldest families of Custer county, and enjoy the respect and esteem of a large circle of friends. Mr. Bradburn is a native of Schuyler county, Missouri, born July 20, 1859, the eldest child of Mart and Ruth (Montgomery) Bradburn, who were parents of five sons and one daughter. The mother died in Missouri and the father brought two children to Custer county in 1884, being one of the original homesteaders there. He died January 21, 1898, and of his children who survive, Joseph E. and Mrs. George Myers, of Broken Bow, are the only ones living in Custer county. Three sons live in Washington. Mr. Bradburn lived in Missouri until attaining his eighteenth year, then moved to York county, Nebraska, and a year later went to Fort Lupton, Colorado, where he remained three years, and then removed to the state of Washington, and worked in the lumber woods there for a time. June 23, 1884, he secured a homestead in north half of the northeast quarter of section twenty-eight and the south half of the southwest quarter of section thirty-three, township eighteen, range nineteen, where he engaged in farming and stockraising. After living there ten years he purchased a farm near Merna, and in the spring of 1897 he and his family moved to their present farm on the northwest quarter of section seven, township seventeen, range nineteen, where he has a fine grain and stock farm of three hundred and twenty acres of land. He came to the county first in the early cattle days, but has in the last few years devoted much of his attention to grain and hog raising. He is a successful farmer and has a well-equipped and improved farm. In the earlier days of his residence he served as supervisor for two terms. J. Lawton, daughter of Jacob and Mary Lawton, the ceremony taking place in Bloomfield, Iowa. Her parents were original homesteaders of Custer county, where they located in 1887. Both died at the home of Mr. and Mrs. Bradburn, the father passing away in February, 1898, and the mother in August, 1907. Seven children have been born to Mr. and Mrs. Bradburn, of whom. six survive: Grace, Jessie, Wilbur, Ernest, Twila, and Marion, all members of the home circle, and Clyde, deceased. The oldest daughter, Grace, is a graduate of the Baptist college at Grand Island and in 1911 accepted a position as instructor of science in the Shelton (Nebraska) high school. All the children were born in Custer county. The Bradburns are one of the best known families of their locality and have the respect and regard of a large number of friends. John B. Schmitz was a very early settler of Custer county and has always been much interested in the development and upbuilding of central Nebraska. He was born in Waukesha county, Wisconsin, January 16, 1847, and is next to the youngest of the four children born to Henry and Gertrude (Krumhultz) Schmitz. He has two brothers in Wisconsin and one brother is deceased. The parents, natives of Germany, came to America in 1845, locating in Wisconsin, where the father died in 1852 and the mother in 1866. They were farming people and John B. Schmitz was reared to agricultural operations. He received his education in the country schools and as a young man engaged in farming on his own account. On March 15, 1869, at Brookfield, Wisconsin, Mr. Schmitz was united in marriage with Ann Wardrobe, a native of Scotland, who came to America in 1857. They continued to reside in Wisconsin for one year, and in 1870 moved to Dane county, Wisconsin, until 1880, then with their five children, came to Fillmore county, Nebraska, remaining there four years, then came on to Custer county. Mr. Schmitz secured a homestead of one hundred and sixty acres of land on section thirty-three, township eighteen, range twenty-three, which is still the home place. He set at work at once to improve his land and bring it under cultivation, and now has a well-equipped and productive estate. In 1909 he erected a fine modern farm residence, which is one of the best in the neighborhood. In 1904 he homesteaded three-quarters of a section of land on sections eight and nine, township eighteen. range twenty-three, which he has brought to a high state of cultivation. He has been active in local affairs, has been director of school district number one hundred and ninety-five, and is recognized as a public-spirited, enterprising citizen. Eleven children have been born to Mr. and Schmitz. namely: Anna M., wife of Jule Ford, lives in Rock county, Nebraska; Isabel B., wife of Lew Fish, of Illinois, has four children; Agnes F., wife of William Smith, of West Table, has one child; Gertrude C., wife of Riley Rice, of West Table, has two children; Walter E., of Custer county; Elizabeth J., Bryan Leonard, of Davenport, Iowa; William C., of Custer county; John J., married and living on West Table, has one child; Laura A., wife of Carl Whitney, of West Table, has three children; Henry O. and Irene, now Mrs. Homer Beardsley resides in West Table. Mr. Schmitz had the usual experiences of frontier life during his early days in Custer county, and being one of the early settlers there, is well known. He has many friends and is representative of the best interests of his community. A picture of Mr. Schmitz and family will be found on another page of this volume. 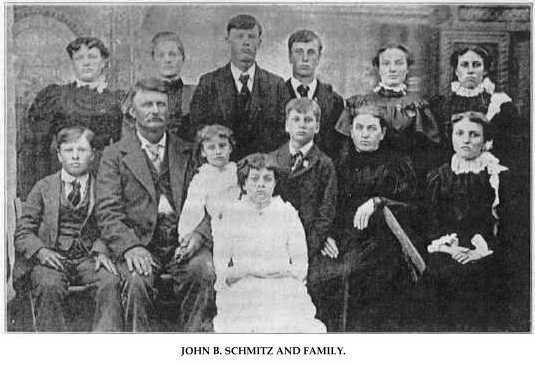 John B. Schmitz and Family. George W. Holmes, whose name is familiar to nearly all the residents of Pierce county, is a worthy representative of the younger progressive farmer of northeastern Nebraska. His father was one of the earliest settlers in this county, coming with his family in 1880, and lived here until his death. Mr. Holmes resides in section eight, township twenty-six, range three, where he has a nice home with excellent barns and outbuildings, and is higly [sic] respected and esteemed by his fellowmen and neighbors. Mr. Holmes is a native of Dickinson county, Nebraska, born June 23, 1876, and is the son of George W., senior, and Mary (Sanford) Holmes, the father being born in Illinois in 1835. He died December 19, 1908, aged seventy-three years, and the mother died, in August, 1905, aged sixty-nine years. The elder Holmes moved to Tama county, Iowa, in the early sixties, and later, with his family, drove through to Dickinson county, Nebraska, where he took up a homestead in 1870, residing there until 1880, at which time they came to Pierce county, Nebraska, and took up a tree claim in section eight, township twenty-six, range three, and pre-empted a quarter section, on which he erected a sod house; here they burned hay three or four years until coal could be conveniently procured. On July 4, 1900, Mr. Holmes, our subject, was married to Miss Maggie Kerr, a native of Scotland whose parents, John and Jenette Kerr, came to America about 1893. To Mr. and Mrs. Holmes six children have been born, whose names are as follows: Jeanette, Mary, Delilah, Bessie and Bernice, twins, and George Daniel. Mr. Holmes is prominent among the old families who were the early settlers of northeastern Nebraska, and has aided in the development and growth of this section. He is well and favorably, known as a worthy citizen. He is a democrat, voting a straight ticket for that party. He is a member of the Modern Woodmen of America and is also affiliated with the Odd Fellows. Mr. Holmes has cause to remember the blizzard of January 12, 1888. His brother came for him on a horse, and by following after a faithful old dog that came with him, they found their way home, chilled to the bone. While a boy, he had a bitter experience while herding cattle on the prairie. A cyclonic storm, accompanied by hail, overtook him and pelted his body and arms until they were black and blue, and for several days were so sore he could hardly move them. The above gentleman is not only widely known throughout Howard county, but also in the entire central part of Nebraska having made his home in different sections since the early settlement of the state. His old homestead, which he has since sold, was one of the best improved and most fully equipped in Fairdale precinct, and is situated on the main road running north and west, all the travel to and from Grand Island being done on this highway. During the early days all grain, lumber and supplies of every kind were hauled over this same trail it being the most direct route through the county to the western country. Both Mr. Scott and his estimable wife are known far and near as the most generous and hospitable of people and have hundreds of friends in every walk of life. On the twenty-fifth anniversary of their marriage a party consisting of about forty families descended upon them with congratulations and words of good cheer bringing also many beautiful and suitable gifts to show the love and esteem in which they were held. James P. Scott was born in Chester county, Pennsylvania, on April 5, 1844, and made that locality his home until he was eighteen years of age. He was the eldest in a family of three, and the only son, now the only surviving member of his immediate family. His parents Michael and Mary (McClimans) Scott were homesteaders in Howard county, the mother's death occurring here in September, 1901, and her husband following her in December of the same year. In October, 1862, Mr. Scott settled in Henry county, Illinois, remained about one year, then moved to Rock Island county, that state, where he farmed up to 1869, at that time coming to Nebraska, his first location being in Colfax county. He spent one year on a farm near Columbus, then came on to Howard county, accompanied by his father, mother, a sister and her husband, who had joined him in Columbus a short time previously. The father filed on a claim on section twelve, township eleven, range fifteen, which was our subject's home place until March, 1910. James also took up a homestead on the North Loup river bottom, near his father's location. Here he has passed through all the different Nebraska times, the lumber for his first dwelling being hauled by himself from Grand Island, in 1883, and as early as 1876 he had gone to the same place for lumber to build a granary. They experienced the Indian scares, had considerable bad luck in raising crops resulting from drouths, etc., but through all the discouragements incident to those days, never gave up hope but stuck to the homestead until things begun to grow better, and has been well repaid for his patience and labor. Since taking up Howard county as a permanent residence, Mr. Scott has been prominent in public affairs, serving as county commissioner during 1894-95 and '96. He has also helped in every way possible to promote the general welfare, build up the schools, etc., and for a number of years, was director and moderator of district number fifty. Mr. Scott was married in Greeley county, Nebraska, on March 18, 1882, to Charlotte Beck, who is a native of Pennsylvania and came to Greeley county with her parents, John and Wilhelmina (Beharne) Beck, three brothers and four sisters, in 1881, one sister remaining in Pennsylvania. Her father and mother are both deceased, the former having passed away January 19, 1891, and the latter March 8, 1902. Their remaining children are settled in different sections of the country. Mr. and Mrs. Scott have had four children, three now living, as follows: Albert M., Harry G., married and living on a farm in Logan precinct, Howard county; and Grace W., who is living with her parents. Mr. Scott was numbered among the prosperous and successful farmers of his section. In February, 1910, Mr. Scott sold his farm and bought a house in Elba, to which he and his wife and daughter moved March 14, 1910, and where they intend making their future home. Alfred E. Weddel, a self-made man, of upright character and recognized as a progressive and useful citizen of Valley county, although a newcomer to that region, has become identified with its best interests. Mr. Weddel was born in Mercer county, Illinois, February 23, 1861, the eldest of three children born to Joseph and Julia (Bugbee) Weddel, who had one son and two daughters. The father was born in Indiana in 1829 and the mother, a native of Ohio, was born in 1841. Soon after the close of the war Mr. Weddel moved with his family to Boone county, Iowa, and a year later to Harrison county, Missouri, where he lived three years and then settled in Nodaway county where he resided until 1887 when he came to Jefferson county, Nebraska, in October of that year. He and his son Alfred purchased an eighty-acre farm there and also had property in Steele City where they first resided. The mother died January 6, 1892, and the father April 6, 1906, having made his home with his son after the mother's demise. All three children are now living, Alfred and Minnie in Valley county, and Cora, now Mrs. D. M. Quigley, of Hayes county, Nebraska.